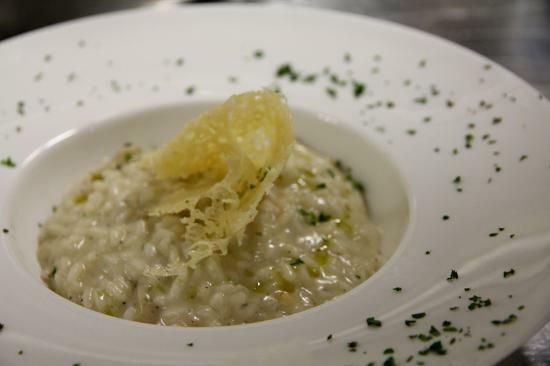 The ingredient that gives great character to this risotto al baccalà, or risotto with dried cod, is generally bought in specialty delicatessens. Its preparation, though straightforward, is fairly laborious, since the dried codfish must be re-hydrated for at 24 hours under running water. Then boil it for ten minutes or so, remove the skin and bones, which will go into the preparation of the broth. Once the flesh is flaky, turn the heat very low, and beat it with a wood spoon, adding as much olive oil as it will absorb (about a quarter of its original weight), until it becomes creamy and homogenous, or for a quicker method, put the olive oil in a blender and gradually add the pieces of fish. Prepare a normal risotto, with just a few slight differences: chop the onion and brown in a bit of olive oil, add the rice and let it brown lightly, then add, in small doses, half the fish and the broth. Then bring the risotto three quarters of the way to done and add the rest of the fish. Finish cooking and cream with a bit of olive oil, grated cheese, and a sprinkle of white pepper.